Meet The Team | Bismarck Eyecare, P.C. At Bismarck Eyecare, P.C., you will find an experienced and helpful team of eye care professionals dedicated to meeting your eye health needs. We recognize you have a choice for your eye care professional and thank you for choosing us to care for your family’s vision needs. We invite you to refer your friends and family to our eye care office. Dr. Taya Patzman is an Optometrist who takes pride in providing patients with the one-on-one interaction required to solve eye health and vision problems. Dr. Patzman is a born and raised Bismarck native. From Grimsrud Elementary to UND, she stayed in North Dakota until her acceptance into Optometry School at Pacific University in Forest Grove, Oregon. 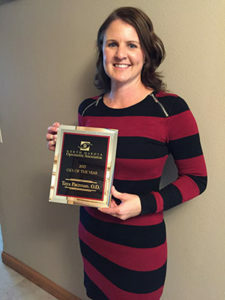 After graduation from optometry school, she couldn't get enough of the lovely winters back in North Dakota, so Dr. Patzman brings her knowledge, expertise, and enthusiasm of Optometry back to Bismarck. Dr. Patzman enjoys caring for the patients in Bismarck, ND and the surrounding communities. Dr. Patzman and the entire staff at Bismarck Eyecare, P.C. are dedicated to providing excellent eye care services to your entire family. Your eye care and experience as a patient is what Bismarck Eyecare, P.C. is focused on. All of our staff members are well trained in their field of expertise and attend continuing education classes throughout the year. The staff of Bismarck Eyecare, P.C. creates an office culture designed for excellent patient care and personalized service.